This week many websites seized our content without permission. It only takes a minute to e-mail for permission to use our content. It only takes a minute to be courteous, and to do the right thing. It only takes that minute to abide by copyright law. Those stealing our content without simply asking permission include The Free Thought Project and Counter Current News. Of the many who seized our content, not one asked for permission. Censored News has no ads, revenues, salaries or grants and forbids the content from being used on web pages with advertising or for commercial purposes. Censored News has published writers for 10 years without pay. Nativeamericanpress(org) also violated our copyright and used the content for profiteering with advertising. Meanwhile, in Indian Country, the collapse of journalism began when the casino industry took control of the national news. Plagiarism, rewrites and copy and paste became the standards at Indian Country Today, Indianz and other national 'Native' news websites. Indian Country Today owners are extremely wealthy. There is no need for the owners to rely on plagiarism. However, in 2006, ten years ago, the newspaper began firing staff reporters, who actually went out on news stories, and began relying on stay-at-home plagiarizers and re-writers. Their scheme was to plagiarize or rewrite others hard work, without ever leaving their homes. They sometimes add a quick phone call to disguise the crime, and often use stolen copyrighted photos to make it appear the reporter was present. The real crime is that there are hard working reporters and activists who make sacrifices to go out and report the truth. They take the risks, do the work and put in the time. They usually pay for the expensive travel out of their own pockets. The plagiarizers -- the reporters and their editors -- are sitting home. They are opportunists who seize the content for their paychecks or glory. These plagiarizers proliferate on Facebook. Facebook is now home to vast media mills stealing content for profit. They seize the content illegally, post it with advertising for profit, or use AdSense for secret revenues. We are asking our readers to be vanguards of truth and honesty. Those who sacrifice to report the truth should not be the playthings of the profiteers. The article that was plagiarized for profit, "Navajo water more polluted than Flint's," was first published at Censored News. I also wrote this expanded article for Narco News, where I am a columnist. The article at Narco News appeared on Google News. Brenda Norrell has been a news reporter in Indian country for 34 years. During the 18 years that she lived on the Navajo Nation, she was a reporter for Navajo Times and stringer for AP and USA Today. After serving as a longtime staff reporter for Indian Country Today, she was censored and terminated in 2006. Censored News was created as a platform for the voices of grassroots Indigenous Peoples and human rights activists. Now in its 10th year, Censored News has no advertising, salaries, grants or revenues. 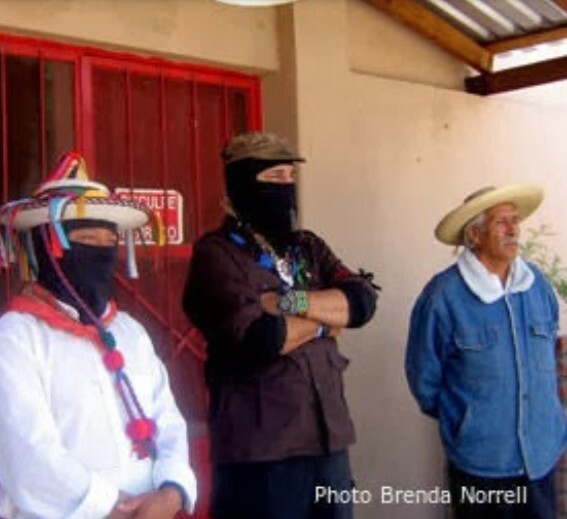 Norrell has traveled with the Zapatistas through Mexico and provided live coverage, with Govinda from Earthcycles, from Bolivia and across the western United States. The live coverage included the live five-month Long Talk Radio on the Longest Walk 2 northern route across America in 2008. The Leonard Peltier and Boarding School Tribunals in Green Bay, Wisconsin, were also covered live. Like Censored News is the NAIS Gazet without Ads or revenues. The NAIS Gazet is an activist site. All expences are paid out of our own pockets. De revenues from the NAIS-shop go in full to Leonard Peltiers'struggle for Clemency! We all know how Facebook enables plagiarism. It's a curse we have to live with. There are -tig armchair- activists who, often without knowing, boycott the real actions out on the streets. That's an ongoing frustration for real activists. Thank you for calling this out, Brenda. At this point, I look solely to your site for reliable, responsible news about anti-Indian politics and practices. And I always credit you, thank you, and link back to you when I reference your work! I hope you would comment under those articles who appropriated your work without asking permission, Brenda. When I looked the other day, I didn't see that you had.